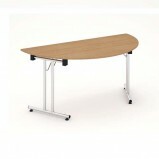 Our range of low cost office folding tables allows you to save valuable floor space when setting out a meeting area at short notice. 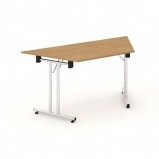 Impulse Folding Leg Tables Featuring stylish folding legs ideal for any training, meeting or leisure application FeaturesImpulse freestanding meeting tableTable folds easily for space efficient storageProvides excellent team working e.. Impulse Semi Circular Folding Leg Tables Featuring stylish chrome folding legs ideal for any training, meeting or leisure application FeaturesImpulse freestanding meeting tableTable folds easily for space efficient storageProvides exc.. 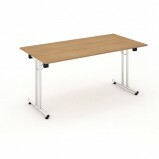 Impulse Trapezium Folding Leg Tables Featuring stylish folding legs ideal for any training, meeting or leisure application FeaturesImpulse freestanding meeting tableTable folds easily for space efficient storageProvides excellent team..
Morph Folding TableThis fold flat range is perfect for when space is a priority. 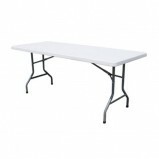 Lightweight, easy to use and durable, they’regreat for outdoor and indoor events.FeaturesVersatile, wipe-clean office table that can be folded flat for fast, ..